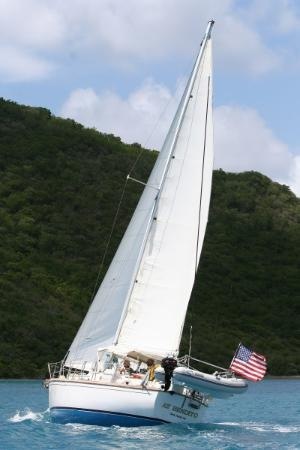 The Mariner 39 was designed closely with Moorings Charters to be a cruising yacht for their bareboat charter business. Earlier boats had inboard shrouds, (latter versions move them outboard), a teak rubrail, and an interior more suited for private cruising. Most were sloops, although a few were cutters or ketches. The Mariner 39 is stoutly built. At the turn of the bilge, the solid-fiberglass hull is 3 inches thick. Quality construction is the hallmark of the Mariner Yacht Company. The boom and keel-stepped mast are by Hall Spars and the top-quality deck hardware is fastened with through-bolts and backing plates. The 12 opening ports, seven opening hatches and two fixed ports are aluminum. The balsa-cored deck has solid fiberglass under deck fittings, and the hull/deck joint is through-bolted every 4 inches. The center cockpit is large and comfortable, with well designed high coamings and seats long enough to stretch out on—an ideal arrangement for family liveaboard cruising---Mariner fit it all in without compromising the boat’s classic New England lines. The aft cabin, with its own companionway into the cockpit, boasts an enormous berth and another large head with a vanity, storage, and shower. Both layout options have a V-berth forward cabin and a large head/shower with vanity aft of it. The main saloon has a fixed drop-leaf table and large settees that double as berths. Aft, to starboard, is either a navigation desk or, in Moorings version, an enormous refrigerator/freezer. The standard galley has a small amount of counter space, a deep double sink, and a 2-burner propane stove. A low walk-through leads to the aft stateroom and allows great access to the engine compartment under the cockpit. It’s a handsome boat with a pretty sheer, a wide teak toerail, and teak cabin-side driprails, cockpit coamings, and handrails. 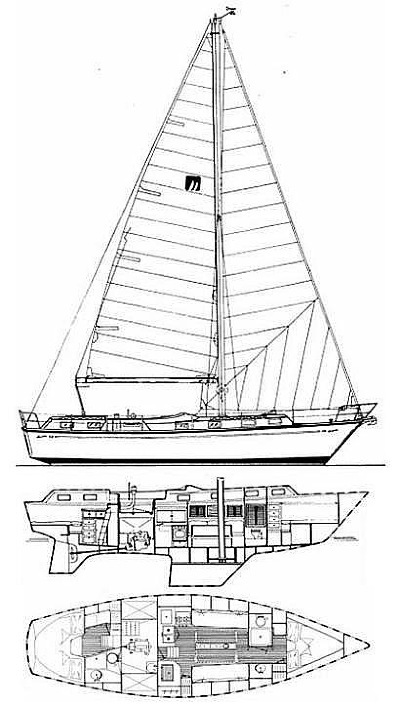 Although designed primarily for the barefoot-charter trade, the Mariner 39 is a fine passagemaker.